Sustainable use of water plays a crucial role in development and innovation process. Water systems and filter faucets provide sustainable and safe water enjoyment. Digitization enables intelligent and sustainable water management. Dubai, United Arab Emirates, 26 March 2019. For GROHE, a leading global brand for complete bathroom solutions and kitchen faucets, water is not only a source of joy, but also a precious resource. Globally, access to clean drinking water is not a matter of course; it often takes a back seat to public perception given the good water supply of industrialized countries in the Western part of the world. On 22 March, the World Water Day initiated by the United Nations wants to remind people of this issue, indorsing this year's motto of 'Leaving No One Behind – Water and Sanitation for Everyone'. As one of the world's leading manufacturers of sanitary fittings, GROHE’s mission is to develop intelligent technologies that enable people to consciously and sustainably use water. The World Water Day’s approach regarding the availability and sustainable management of water is an integral part of the GROHE brand’s sustainability goals. 'GROHE's goal is to design and manufacture products that enable users to safely and responsibly use the resources of water and energy. In addition, we are constantly striving to conserve resources within and beyond our operations,' said Thomas Fuhr, GROHE Executive Director Operations and responsible for sustainability at board level. The water system GROHE Blue Home offers still, medium or sparkling water that is tasty, filtered and chilled to the optimum drinking temperature and comes directly from the striking kitchen faucet, combining convenience and enjoyment both elegantly and sustainably: Time-consuming water purchases, annoying hauling of water crates or disposable plastic bottles are a thing of the past. With GROHE Blue, a family of four avoids an average of 600 plastic bottles per year, which also benefits the environment: CO2 consumption is reduced by approximately 61 percent compared to bottled water and there is less plastic and packaging waste. While it is a matter of taste in many regions of the world, there are also countries where water directly from the tap cannot be used for every purpose due to its insufficient water quality. Therefore, bottled water often replaces available tap water when it comes to everyday use in the kitchen. GROHE Blue Pure filter faucets feature state-of-the-art filter technology provided in two different versions by the BWT brand, offering maximum taste and safety directly from the faucet. The Ultrasafe version eliminates chlorine, biocides, pesticides and bacteria, making water that was not drinkable in regions with poor water quality now safe to drink. GROHE Blue Pure allows unrestricted use of tap water provided from official utility suppliers in any kitchen or bathroom for applications without any restrictions. With the intelligent water security system GROHE Sense and Sense Guard, GROHE has set the foundation for a smart water security and water management system. 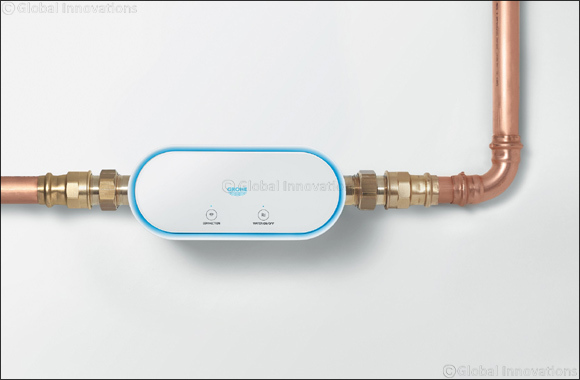 A future ground-breaking innovation will allow the water consumption of a house or apartment to be exactly trackable and customers with input of their water and energy prices to receive a precise statement of their costs. This not only ensures full control of the valuable resource of water, but also offers the opportunity to adapt user patterns and to use water more consciously. Hence, the GROHE brand not only cares about cautiously using water but also offers customers the opportunity to make conscious decisions about their daily use of the precious resource by applying digitized product properties.